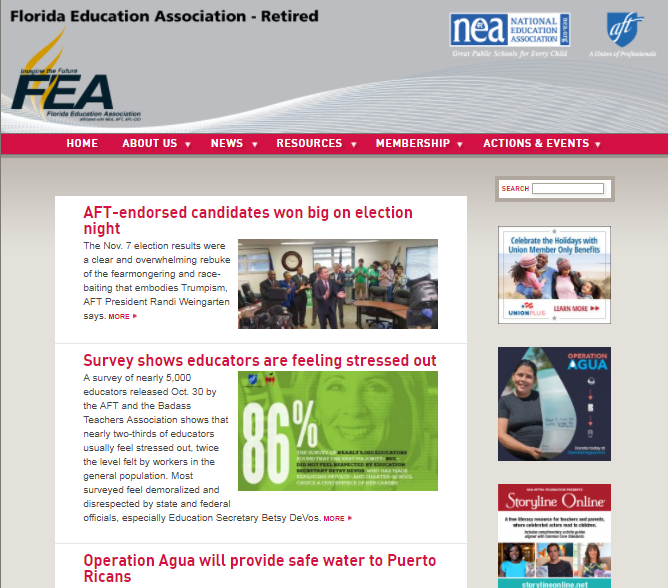 FEA –Retired members support all educators on important retirement and health issues. Members sponsor informational forums, and get out the vote activities. FEA-Retired members actively lobby the Florida Legislature on important issues to you now and in the future. FEA-Retired provides grants to classroom teachers to enhance their programs across the State. With active local chapters throughout Florida, FEA – Retired welcomes all retirees to their rapidly growing organization. If you are retiring next year, you can join us as a Pre-Retired life member at any time before retirement and never have to worry about joining after you retire. Your Statewide Network welcomes you! They have member benefits too! The FEA-Retired program consists of chapters and direct members from across the state. Current active chapters include Brevard, Broward, Dade, Duval, Flagler, Gulf Coast, Hernando, Hillsborough, Lake, Leon, Orange, Palm Beach, Pasco, Pinellas, Polk, Seminole, Volusia, and Washington/Holmes, Okaloosa, St.Lucie, St.Johns, Alachua, Marion, Lee, Osceola, and UFF. Find your district leader.